A slave master stands off camera, cracking a large whip. By the grace of my sister and her husband, my favorite senior citizen hitchhiker is here: my Mom. I may be too old for this. My mom is a whirlwind of activity under normal circumstances. At seventy-five, she has a social schedule that blurs the mind. It's hard to catch her at home at times. She line dances, goes out to lunch and dinner with friends, works at the local election board and delivers meals to family members "just for something to do." This week, she is visiting with me and I feel like I'm abusing her; she keeps doing things for me. She reminds me that she needs something to do, but I may run out of things and I'm usually pretty creative. I have a kitchen buddy now. When I cook, she cleans behind me. Now I can't find my silverware; I know I have teaspoons. I don't know what to do with my own personal kitchen assistant; it's usually my private domain. Mom doesn't cook, however. I know it's true because my sons have often told me that their favorite Grandma meal is Jello with Mandarin oranges. Though she was raised by her grandmother on a farm she had no interest in the art of home cooking. The same grandma taught me how to fix many things that Mom loves - why she never paid attention to those recipes, I'll never know. Mom always asks me how I know how to cook her favorites, but she doesn't. Later she told me, "Who wants to spend all that time cooking when you'll just flush it down the toilet an hour later?" Who can argue with that logic? I think I'll stop cooking today. Everywhere we go, she grabs her wallet and tries to pay - I'm faster, by the way, but she still tries. This is not one of my usual daily challenges. I remind her she is my guest. She's told me some stories ten times since she's been here. Mom asks whether or not she has told me a story, and I tell her that she has; she tells me the story again anyhow. She'll ask me if I remember when something happened in our family, and I'll tell her I do remember when it happened. She'll give me a play by play every time. Other comments are in the "obvious" category, like when she said, "Hey! Look, it's a Tennessee license plate!" I live in Tennessee. I'm not nearly as excited. I do, in fact, own a Tennessee license plate; all my friends do. When we got out of the car after a recent errand run, I commented, "Look, it's a Tennessee license plate!" She got a kick out of that. The week before she arrived, I had my living room painted and was moving furniture and updating some decor. I purchased and hung new curtains. With my crazy ceiling height, it is no surprise that every pair of curtains needs hemming, but I just had time to pin up the hem before my company came. 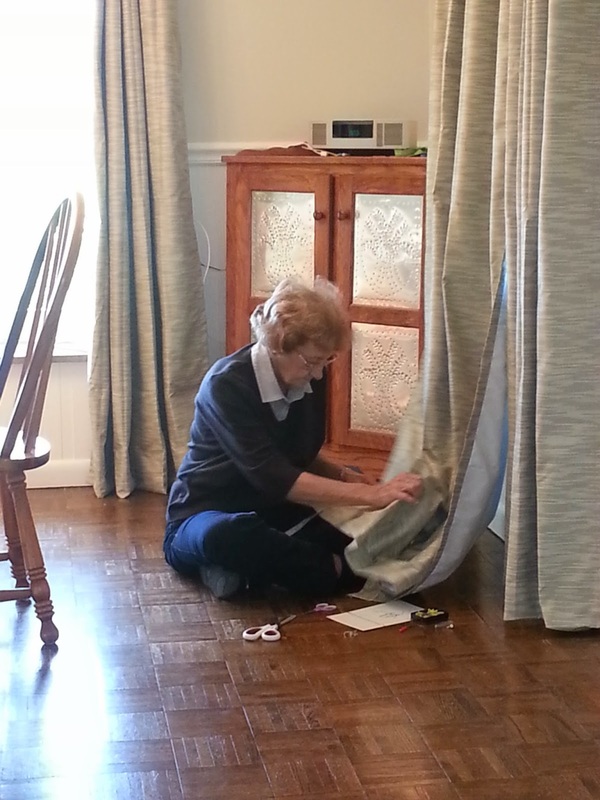 Mom is sitting on the floor, yakking away, hemming eight panels of the new curtains. As I said before, I feel like I'm abusing my own aged and widowed mother, but please do not call local authorities just yet. She's not done with those pesky curtains yet. At fifty-five years old, it is still nice to have a Mommy. I may have to put new curtains upstairs, too. There are worst things in life. I'll roll with it. Don't get me started about mothers and their mothering. I'll never forget the time I went shopping with my mom. We were riding a crowded elevator in a department store when she noticed a smear of chocolate around my mouth. She reached in her purse, pulled out a hanky, SPIT on it, and wiped my mouth clean. My cheeks turned crimson with embarrassment. That was no way to treat a 42 year old man in public! Seriously, my mother acted the same way. When I knew she was coming for a visit I'd spend the day cleaning. The minute she arrived she started cleaning the whole place again. She was never satisfied until the toilet seat was clean enough to serve dinner on (which was also quite embarrassing because it's very hard to comfortably seat a party of six in a loo). Happy Wednesday to you, dear friend Cherdo! You have to love the Moms...it's genetic engineering to spit shine your own child. And BTW, she'll play all the music she can get her hands on , Shady! Have a great day...gotta find something else to do, ha ha. I'm a mom hugger from way back. She lives about ten hours away now, so I'm elated that she gets to come down while we've got pretty Fall leaves, etc. How can she sit on the floor like that? If I sat on the floor, I'd never be able to get up again. One of these days, I bet my kids will make me sit on the floor. Then they'll run away, giggling. Lucky for you, you're wearing your Life Alert pendant! Janie, I can't get my aching hip and knee down there with any comfort level. I've bounced my poor frame on the ground, on the hood of a car, down a ski slope, you name it - I have routinely broken the law of gravity. I've got plus-sized aches and pains, ha ha. Help! I've fallen and I can't get up! I know this story isn't funny, but I still think it's funny: A lot of the patients admitted to the nursing home where I worked had fallen at home. Many of them had Life Alert. Some of them were on the floor for God only knows how long. Every time I asked, Why didn't you use your Life Alert?, they said, I couldn't remember how to press the button. Some of them forgot how to press the buttons on their call lights. I kinda liked it when they forgot how to do that. You're not abusing your mom; you're making her feel useful. My hubby and I still do all kinds of stuff, but few things make us feel as good as when our kids or grandkids "need" us to do something. Enjoy this special time with your very own "personal kitchen assistant!" I agree with Susan. You're doing a good deed by making her feel "needed." I'm also impressed your mom can get up from the floor! That's awesome that you're Mom is so active and no matter what they do you can't help but love your Mom and vice versa.